High end finishes in McDowell Mountain Ranch. 4 Bed(one down), separate Den & 3 full baths. Bordered stone floors and a gourmet kitchen ideal for entertaining. The island has bar seating w/pendant lighting, full granite slab counter tops, built-in walnut butcher block and a Kohler faucet w/stainless undermount sink. Extra deep cherry cabinets and marble back-splash. High end appliances with built-in 42'' SubZero refrigerator, WOLF gas cooktop, WOLF microwave/oven and 36'' WOLF electric oven with pizza stone rack. The kitchen overlooks a great room that spills out into a resort like backyard with mountain views and a heated pool & in-ground spa. Freshly painted Interior/Exterior and Pool Decking. Owner's spent $125,000 upgrading this remarkable property (see addt'l re This is a wonderful home that is great for raising a family, entertaining friends and located in a wonderful neighborhood. 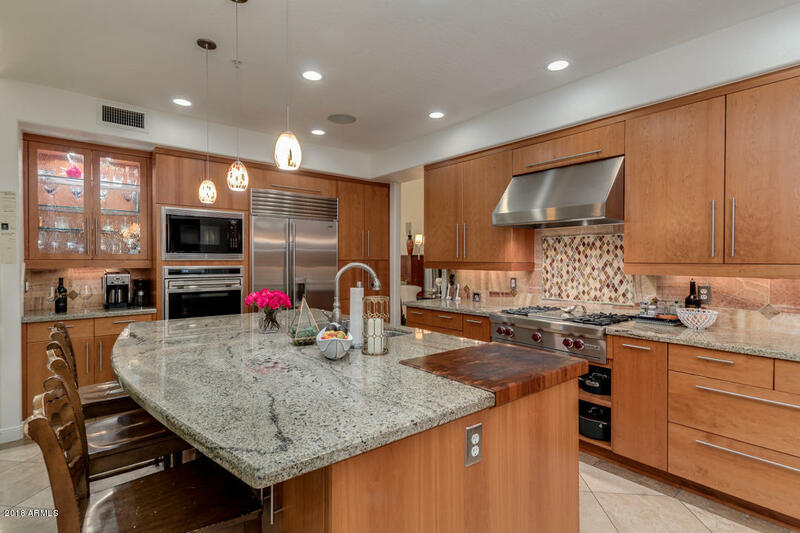 A gourmet's kitchen that is ideal for entertaining that was remodeled by Susan Stahl and Keith Wolffram. Completely gutted in a $125,000 whole house remodel that included new electrical work to meet the requirements of the new appliances, can lighting, under cabinet lighting and pendants over the full slab granite counter top, Kohler faucet with a built in walnut cutting board. Kitchen soffits were enlarged to accept the 12 inch deep Hertco Cherry cabinets w/stainless pulls, complete with a pet food cabinet. All counters including the kitchen were raised 4 inches to 36 inches for ergonomics. The kitchen appliance package is SubZero, WOLF and ASKO. The SubZero is a 42 inch side by side with through the door ice and water. The WOLF double oven consists of a WOLF Microwave/Oven combination and a 36" in wall electric oven with a pizza stone rack. The cook top is the classic red nobbed gas WOLF 4 burner cook top that includes a built in grill between the burners. The Asko dishwasher completes the appliance package that today's replacement cost exceeds $25,000. The kitchen overlooks a great room that spills out into a beautiful backyard with excellent mountain views and a heated spa and pool that feels like a resort! The rest of the house features new light fixtures throughout including cabinets in the bathrooms, Kohler toilets, new faucets and a heavy glass shower in the master. The master is large with a large walk out patio with exceptional mountain and city views, perfect for a cup of coffee in the morning or a glass of wine at night! Flexible floor plan has 1 Bedroom plus a Den/Office and Full Bathroom downstairs.